I am almost through with student teaching! With all my classes, papers, and lesson plans, it’s been hard to keep up with my daily posts. Don’t worry, this won’t be an issue for much longer. My teaching position ends in early December. It’ll be great to get a job and earn money again (FYI: my program doesn’t allow you to work during student teaching, so you have no income), but I am going to miss my students so much. They are all awesome people and I’ll most likely cry my eyes out when I have to say goodbye. Enough sappy stuff, let the pumpkin-ing continue! Target released a ton of pumpkin themed items this year and, although the majority turned out to be disappointing, there were a few shining stars. (Like these cookies. Ditch the filling! The pumpkin spiced ginger-snap-like cookies were amazing on their own.) 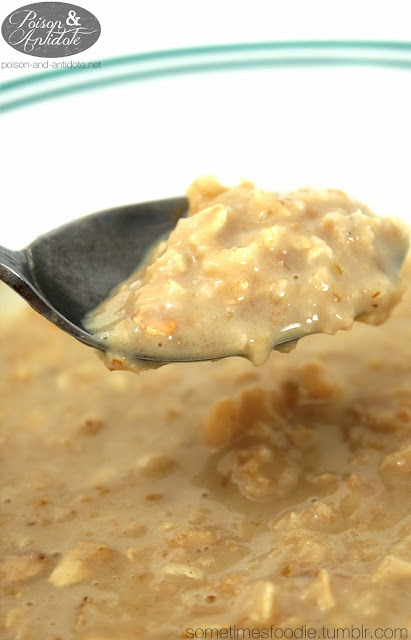 It’s oatmeal weather here in Jersey, so it’s the perfect time to give this item a try. Farms formula? Do any of you notice the change? The green and white crosshatched area has been replaced with a silvery background, white crosshatching, and snowflake shapes! Okay, so this isn’t a huge change, but I do like the fact that Archer Farms is finally switching something up. IS this the packaging for all of their instant oatmeals? Or is this something for the seasonal flavors? Other than the wintery makeover, the box is very basic and it follows the same design aesthetics as last year’s pumpkin spiced granola. It’s an appealing and effective design, but it’s boring. I stirred everything up and took a bite, it’s definitely pumpkin spiced, but the flavoring is a lot more mild than I was expecting. 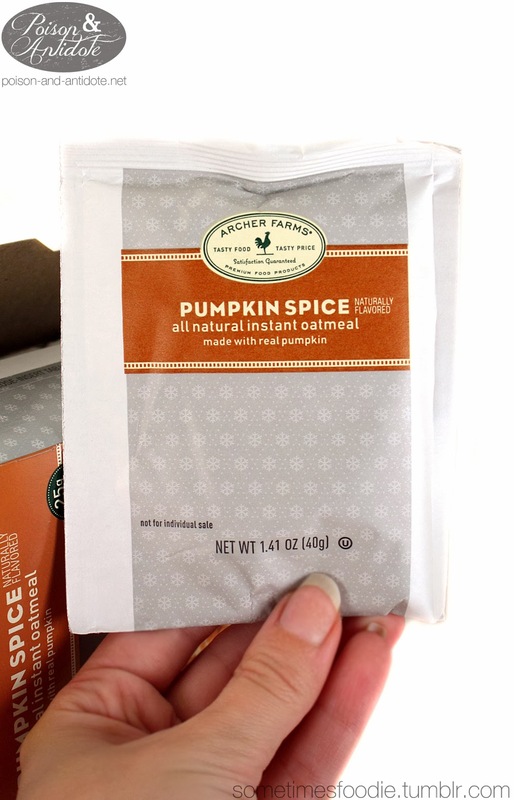 (Then again I might be getting desensitized to the pumpkin spices at this point.) The spice intensity might not be in-your-face, but the oatmeal was satisfying, warming, and delicious.I really enjoyed it and it was a nice change of pace from my typical oatmeal flavors. On a Pumpkin Scale of 1-5 (5 being the most pumpkin-y) I’d give this a 2.5. 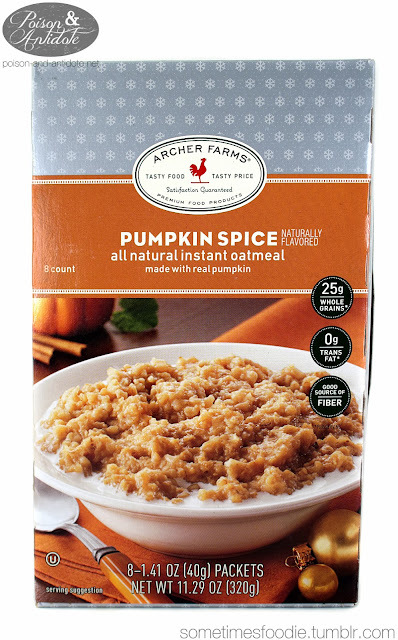 This is yummy, but a spoon of pumpkin butter or sprinkling of pumpkin seeds would kick this up a seasonal notch.